“Cattails are true wetland plants. They are not satisfied with simple wet or muddy soil, but prefer to grow directly in standing water. Their natural habitat is along the edge of shallow lakes and slow-flowing rivers, but they also find excellent homes in countryside irrigation ponds and urban parks. Cattails, called bulrush in the British Isles, are classified in the genus Typha. The flowers and seeds form on tall, stiff stalks that rise high out of the water. Cattails are monoecious, which means that male and female flowers bloom separately, but both types occur on each individual plant. The flowers are arranged in dense clusters at the tip of the stalk, with the female type below and the male type above. The male flowers produce copious amounts of yellow pollen, which is carried to the female flowers on the wind. When pollinated, the female flowers develop into brown sausage-shape fruits that contain thousands of very tiny seeds. Each seed is attached to a fine hair that serves as a parachute for dispersal on the wind. When the seeds ripen, the fruit disintegrates into a mass of fluffy down. Cattails are quick to colonize open shallow water habitats. Once established, they spread rapidly by sending out underground runners call rhizomes. A stand of cattails can rapidly monopolize the habitat, forming dense clone colonies that exclude all other competitors. About a dozen or so species of cattail are found worldwide, three of which occur here in Japan. The most common species is the gama, with a large, thick seed cluster. The Japanese term gama is both a generic term for cattails and the specific name for this species. 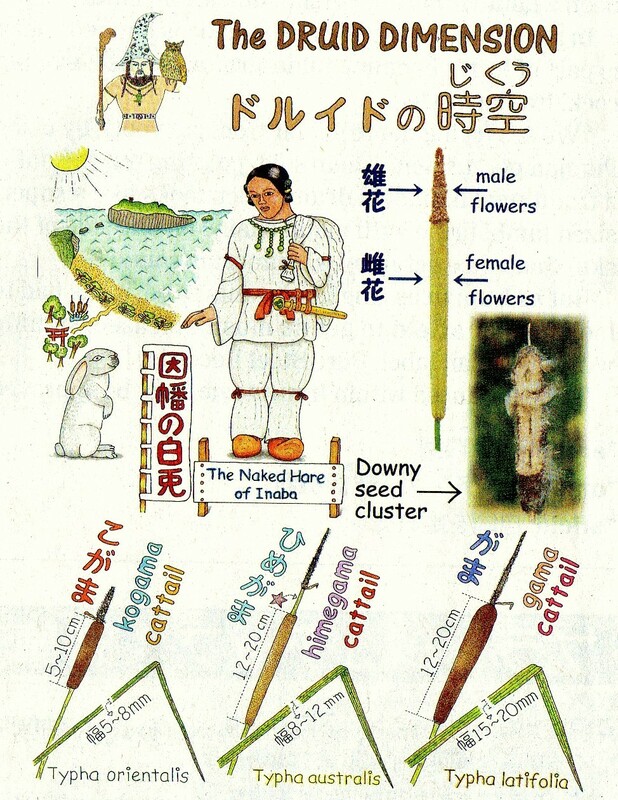 The hime-gama (“princess-cattail”–hime usually designates a slighter, slenderer form) has a thinner seed cluster, and can be reliably identified by a noticeable gap that separates the male and female flower clusters. The ko-gama (literally “small-cattail”) closely resembles the gama, but has a much smaller flower cluster, and also clearly narrower leaves. Cattails are useful plants. The underground rhizomes are edible, and the fluffy seed down was traditionally used to stuff garments and blankets such as Japanese futons. When I was a small boy growing up in the northeastern United States, we called cattails “punks,” and burned the brown seed cluster to keep away mosquitoes. Cattail pollen is also used in traditional Asian herbal medicine as a diuretic, and can be applied directly to soothe minor cuts, burns and skin abrasions. Called ho-o, bags of pollen are still available online and in very well-stocked pharmacies. The antiquity of this traditional herbal treatment is attested to by an episode recorded in the “Kojiki,” Japan’s classic mythology text written in 712. In this episode, which occurs at Inaba Beach on the Sea of Japan shore of Tottori Prefecture, a white hare gets stranded on an offshore island, and tries to trick a school of sharks into helping him get back to the mainland. Pretending admiration for their great numbers, he gets them to line up so he can hop across their backs. At the last moment, the final shark becomes aware of the trick, and jumps up to rip open the hare just as he vaults onto the land. Just at that time, a phalanx of 80 kami deities, all brothers, come walking along. They are bound to woo a beautiful princess. Each one is sure that he will be the one chosen to marry her. At the very rear of the procession the youngest, Okuninushi, struggles and staggers along, forced to carry all his brothers’ heavy gear. The older brothers first encounter the injured hare, shivering in pain and misery. Sadistically, they advise him to wash his wounds in saltwater then sit out to dry in the sun. Naturally, this treatment only makes the pain far worse. Finally, along comes kind-hearted Okuninushi. Feeling sorry for the injured hare, he advises the animal to wash his wounds in fresh water, then roll around in a blanket filled with pollen from the cattails that flourish around the river mouth. The hare complies, and his injured skin is miraculously healed. In gratitude, the hare prophesies that Okuninushi will be the one whom the princess chooses. Okuninushi goes on to become one of the great heroes of Japanese mythology. In later episodes he establishes a great kingdom centered around the Sea of Japan coast, and is worshiped today at the grand shrine of Izumo-taisha. Very interesting story in a personal way as Kazuko my japanese wife was born under the sign of the Hare/Rabbit and as I type this message I am weary a navy cravat with a simple hare motif. I wonder if you could kindly let me know of information on stories/tales related to Jomon period e.g. which relate to everyday life, living conditions , food, hunting – personal relations etc.